The cities of Spokane County are distinguished by the native Ponderosa forest that separate us from Midwestern and Eastern cities, but we are losing that forest and not renewing it. Spokane Ponderosa is committed to saving our region's beautiful heritage in the Evergreen state. Spokane her unique look and feel. Let’s help Spokane continue to be Spokane and avoid becoming “Anytown, USA”. 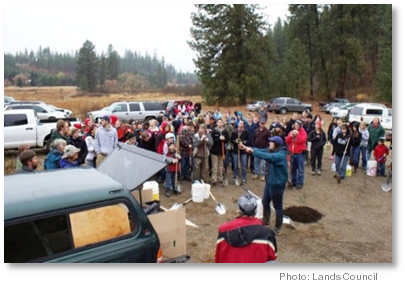 If you have a civil group looking for a community project and would like to plant Ponderosa Pine seedlings, please email us at jacqui@SpokanePonderosa.com, we’ll provide the tools, trees, and training, and you provide the muscle!